Here you can read the Executive Summary and Recommendations of the report broken down by chapter however this should not be a substitute for the full report where the recommendations are discussed at length. This is not the first international financial crisis the world has seen. This tells us two things. First, in trying to prevent or dampen future crises, we must not focus too heavily on the specific character of the present crisis. We must focus on those factors that are common across financial crises. There will be a different financial innovation or product at the centre of the next crisis. Second, it is unhelpful to think in terms of increasing or decreasing the quantity of regulation. There is good and bad regulation. If elements of the current approach to regulation incentivised systemically dangerous behaviour, doubling up on existing regulation or spreading it more widely may make matters worse. While we doubt that financial crises can be prevented, we do believe strongly that policymakers, regulators and supervisors have the power to make them less frequent, shallower and with less spill over onto the welfare of ordinary households. The purpose of this report is to set out the regulatory approach that will help them do so across a variety of countries. Large international banks have promoted the idea of a level playing field in regulation between countries (home country regulation) and within countries (unitary regulators and an end to ‘Glass-Steagall’ type segmentation of financial sectors). 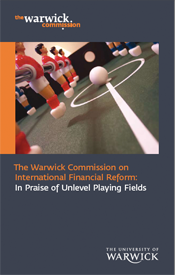 It seems heretical to argue against ‘level playing fields’, but in certain areas of finance, an unlevel playing field has merit. We need an unlevel playing field between countries as a result of the policy responses to economic cycles that are often less synchronised than they appear. We need to tilt the playing field within countries to reflect the unlevel capacity of financial institutions for different types of risk and to help risks flow to where they are best matched by risk capacity. We need a financial system that is robust to shocks, and that requires diversity, not homogenous behaviour derived from the blanket application of the same rules and standards on valuation, risk and trading. An unlevel playing field between countries is also desirable so as to best take into account different national political priorities, financial structures and institutional capacities. 1. Regulation needs to be formally more countercyclical, to offset the endogeneity of risk that arises from the credit cycle. Capital requirements, leverage ratios, maximum loan-to-value ratios must be tightened in the boom and loosened in the crash within a rule-based framework. 2. Risk-taking must be matched to risk capacity for the financial system to be resilient. One way to achieve this is through capital requirements for maturity mismatches (administered in a manner to avoid procyclicality). 3. Regulators must have the flexibility to apply tighter regulatory requirements on systemic institutions, instruments and markets. Regular system-wide stress tests should help to identify what is systemic. 4. Greater emphasis must be placed on host country regulation within a more legitimate system of international cooperation. Host country regulators must be able to require foreign and domestic banks alike to keep local capital against local risks. Accountable global institutions should coordinate host country regulations, share information and lessons in order to improve regulatory effectiveness and limit regulatory arbitrage, and regulate market infrastructure for global markets such as single clearing and settlement houses. They should also be engaged in capacity building for countries with less developed financial systems. 5. Incentives for the financial sector and for financial firms to grow in size and influence, and to concentrate on short-term activity, must be offset, perhaps through additional capital requirements for large institutions. The full report and individual sections are available below. These downloads are PDF documents and require a PDF reader to access. The Adobe Reader is available as a free download. Chapter 8: Institutional Issues: The Locus of Regulation, Host or Home?